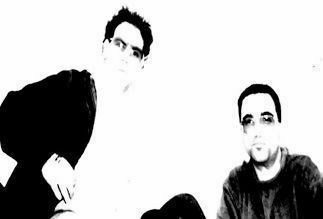 Xhohx (pronounced "ksoks") are the Belgian duo of Ramon Ribas Coca and Oregolakatzor. I reviewed their debut CD - Karyotypexplosion - last issue, and described it as a Doom Metal version of Present, throw in some Magma, Captain Beefheart, Ruins and Etron Fou Leloublan and you might get something like Xhohx. If that description interests you than CLICK HERE to read the review and then come back for the interview and more details on this amazing duo. Aural Innovations (AI): Give me some history on the band. How long have you been together and what mutual interests and musical ideas brought the two of you together ? Oregolakatzor: We are from northern France (Lille / Rijsel). As for me I discovered the Rock around 12/13 with Bowie "berlinoise" time, in the wave of Joy Division, Killing Joke, Crass, P.I.L.. We are in music for many years with an involvement in several bands of different kinds of music. But it occurred to us 7 or 8 years ago a real musical mutation with the discovery of other territories which has brought us a break. It was a realization time which came to us as a reaction against our local musical scene which focused on an interpretation of bands like neo metal style and pop music in general, which makes you want to dance. 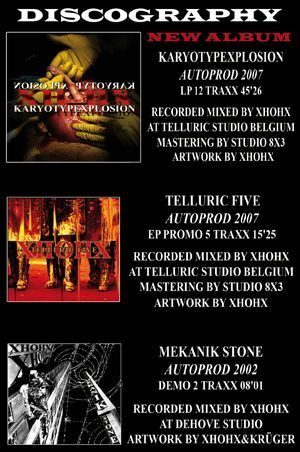 From this reaction, XHOHX was born in 2002 with a first demo called "Mekanik stone" and several local gigs in the Benelux. Then we set up our own humble local studio from where we created "Telluric Five", a promotional EP in anticipation of our album "Karyotypexplosion" which came out 6 months later. Ramon: We learned music and to play instruments on-the-job, but with the help of quite a few books too. After having had our ups and downs with several bands which didn't really grab us we knew we had to go our own way. The original idea was to do some music searching and this eventually became XHOHX, with all the difficulties it entailed. Improbable was our slogan yet we restrained ourselves... mind you... We didn't wish to revolutionize anything but only put forward a new way to see music. Anyway we have always a passion for music and this isn't the end of our story. AI: The RIO/Avant-Prog spirit is clearly evident in your music, yet I can hear punk, metal and a variety of other influences. I struggled to make analogies when I wrote my reviews (that's a GOOD thing). Was this intentional or did it just work out that way ? Oregolakatzor: Deliberately, like all musical fanatics, we listen to any number of music, but I don’t think it’s bound to influence us. Quite the opposite, we learned to stand back faced with a profusion of artists and styles while remaining admiring. This ability to isolate ourselves during the composition stage is unavoidable in order to venture in forbidden territories, to go in search of our own hidden emotions. At the moment we receive almost each week some new reviews and the least we can say is there has been a variety of stylistic names to try to define it - punk-jazz, brutal progressive, noise math-rock, Indus metal, artbear zeuhl etc. I think it's difficult to cling to certitudes. XHOHX is a living musical proof. Ramon: To come back to the RIO matter, what it means to us today, politically speaking, I always take up this famous story of the people in power who reassure themselves that people well spend their time to not think of another thing than themselves. We are lost in the majority crowd, although we're respected and many people are very fond of our music and perhaps even our philosophy. We're agreed on the idea that Art, marked by politics, can raise the way people think. It's this uneasiness which oozes from our music and perhaps that's why it's difficult to make out our intentions and influences. AI: The music is so completely crazy, yet at the same time seems so controlled. How do you create your music ? Is it carefully composed? Or is there an element of improvisation? Oregolakatzor: We don’t use any particular formula, and after a long process of de-education it now becomes a automatic, a second nature to us. We gradually break the ideas we set up. This development breaches, some “releases” induce the encouraging mistake, the interplay of several sound elements makes illusions sometimes, a driving force which will excite our inspiration. Ramon: Everything is scrupulously written. We start from the principle that one note leads to another but not the most obvious. Each of them is a schizophrenic entity with many-sided character. It's the same process with rhythm, nearest the spontaneous writing. Of course we have a strong tendency to build up tortuous structures in which notes are like a planet which has lost its star whose aim is to find it. We intended to approach an experimental way to play music and we're really worried we skipped some steps in the process. AI: Yours is some of the wildest and most intense progressive rock I've ever heard. How has the response been to the album ? Oregolakatzor: From the point of view of the press? For the moment, in the whole the album got a warm response from it, particularly in the USA and Japan. In Europe too but with some subtleties. Some people have not hesitated to shoot us down, complaining of the too abstruse character of our music. From others it’s only a heavy-going stuff and inaudible or even more that one can’t call it music… we mix all and anything just because it’s avant-garde… we find that in the least bit funny and take it humorously. We can well imagine that it’s not easy to make such a job. In fact we couldn’t care less about all that. They can create themselves the band of their dreams! Ramon: Yes, there are mixed reviews in France and Europe. It's rather a rejection of the novelty because they find the content unsuitable for their "chaste" sense of hearing and not enough Progressive too. Everything is relative. In any case it was not our ambition to take its place in anything. XHOHX is XHOHX and that's good enough for us. AI: I like the artwork a lot on the CD, both the cover and inside. It fits the music. Was the artwork computer generated? The little hand and arm "hatching" out of some kind of body organ is very cool. Ramon: Inside, the misshapen person may be representing what is wrong with us - the irremediable aspect of our condition in a manner of speaking. In fact, it's an act of provocation for prompting us to call ourselves into question. It's the problem of this modern society where we think we have gained control over all that surrounds us when we are our worst enemy... some people are badly shaken up by the cover but it's a good thing some other appreciate our work and feel it with real emotion. AI: Are just the two of you making all this music ?!! Oregolakatzor: Except the mastering signed by Ugo Sanna and the guest participation by Greg on sax in Turmenza, It has been produced from A to Z by ourselves in our humble "Telluric Studio". So it's DIY through and through. 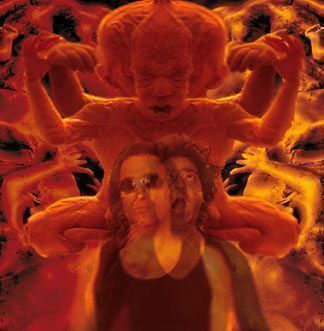 For "KARYOTYPEXPLOSION", and I repeat, for this first album and I repeat for this one, we use a virtual drummer in the person of a computer whose the first function is to endlessly repeat the military pounding of the sound of jackboots on the pavement. It's a celebration of the eternal man/machine conflict where the organic matter tries to overcome the robotic beat from crushing bone factories and achieves its aim by destroying the metronomic system with some "non- rhythmicals". Voices are those of a contemporary regressing by a dizzying fall towards the early time to tear themselves from its archaic cerebellum... the primal scream of a misshapen person shouting - our captivity in the realm of musical dogma is over! Ramon: Yes we are only two in the band and everything is entirely made by ourselves except the computer performing and mastering. Perhaps we'll do it some other time to see things to the very end. We value our freedom of composition taking care in such a way that it's possible to play in live performance. Our policy has been always to break our musical ideas in order to rebuild them in a better way and the rest flows in a natural way. AI: Tell me what a live XHOHX performance is like? Oregolakatzor: It’s like a frenzied adventurous overload that we want to share. An agitation in which we cut some flints echoing with crashing and banging in the valley of our consciousness. Ramon: We try to take up the stage as if we were three or more. It's always a challenge for us! AI: In live performance is it just the two of you or do you use additional musicians? Oregolakatzor: Yes, that’s right, we are only two in live performance. For the concept of karyotypexplosion, we want the listener to be carried away by our performance without realizing we are only two on stage. Ramon: In fact, we found it necessary to be a duo in live performance. Not that it's the best solution, but it turned out that over here it's very difficult to find musicians who can make heads or tails of our music. This line up is absolutely necessary in order that our live performance comes true. AI: I see on your Myspace page you are organizing a European tour. How is that shaping up? Oregolakatzor: Yes, we are getting ready to tour in France for September and also in Europe the following months, in two part - first in the Northern part (Germany, Benelux, Poland and Scandinavia) and after that the Southern part (Switzerland, Czechoslovakia, Slovakia, Italy, southern France, Spain and Portugal). To tell you the truth, like quite a few bands, we are not signed and in the meantime it’s the best way to be free to do what we want. It’s a huge process but exciting too. It’s a bit early to start talking about success. We always must fight. Ramon: The greatest challenge is to get them to understand our art, hoping they are open enough to new ideas. That's where the problem lies. AI: Any other news or future events you want to share with our readers? Oregolakatzor: Well... we plan to devote the coming year to doing the maximum of gigs while promoting “KARYOTYPEXPLOSION” in the independent international network and focus the maximum of our energy to develop the admission of our music, making connections with those who wish to support us, playing with bands whose music cares for us, strengthening the connections with those who hearten us today. And about that we are extremely grateful to you for interviewing us because thanks to your keen interest in “new musics”, bands still anonymous like us can at last find a platform to become known. Ramon: I can't say better, thanks so much for taking an interest in us.